I really should try to remember, when I'm browsing books at various times of the year, that I like to have a ghost story (or collection of them) to read over Christmas. 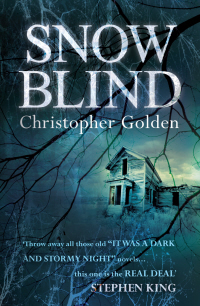 As it happens this year I already had one waiting on my Kindle so Christopher Golden's Snow Blind it was. The novel proved just right for the job, not exactly a traditional ghost story but with just about the right balance of darkness and hope. It's set in a New England town that's used to snowstorms every winter but two, twelve years apart, prove particularly deadly. The first few chapters take place during the first storm, which claims a couple of dozen lives. Most of the book takes place twelve years later though, when the approaching second storm also brings with it some of the people who died in the first. There's a traditional ghost but most of them possess the body of someone living, with a warning that the storm contains an evil supernatural force, the real reason for the high casualty rate. I thought the book nicely set up the various groups of characters, each of whom loses someone in the first storm only to have them come back in the second, with not all the returnees necessarily being welcome visitors. So there's plenty of people to feel invested in as they try to stay safe from the ice creatures, and maybe even save their loved ones' ghosts from their limbo state.